I was on the fence about butcher block with Adel Medium Brown cabinets until I saw this pic. Beautiful right? (Not that you can tell since HGTV removed the link and I now can't find the darn pic anywhere!) I bought two pieces of IKEA Numerar Butcher Block. One was very warped and the other was pretty good. If you are driving from far away to buy this, make sure your piece is okay before you drive back home. If you need to cut it, don't freak out. Not as difficult as people try to make it seem. The key is to use a strong circular saw (My little cordless number would never had done the trick. You want something with oomph.) And buy a new blade. I don't know that the number of teeth matter so much or whether it's a carbide, but make sure it's new and sharp. I even used the circular saw the cut out the hole for the cooktop...but we'll get back to that. And don't forget to save that piece...a little sanding around the edges and I now have two extra cutting boards. 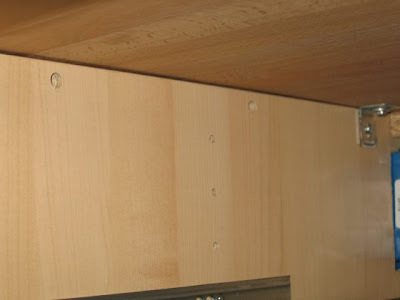 Pick a spot close to the edge and screw the screws in the middle of the oval space of the bracket. 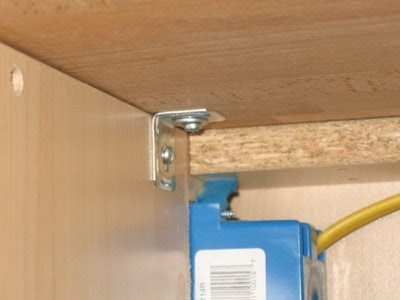 I read somewhere that if you screw close too snug up against one end or the other that the wood won't be able to move do to changing humidity levels and what not. I don't know how true that is, but better safe than sorry. Once it's screwed in, it's time to seal it. A lot of what you choose depends on how you plan to use it. Ikeafans has a great article on finish options for butcher block. I opted against IKEA's Benhandla because it contains linseed oil which can instantaneously combust. Kinda scary, right? I didn't sand between coats, as some people do. I simply poured it on and wiped it all over in whatever direction I felt like with an old mateless sock. I did it when I was waiting on hold with my doctor. I did it while my coffee was brewing. While the dishes and laundry were running...you get the idea. People act like it's a big deal, but it only takes a minute or two. If you're installing it over a dishwasher, then you need a vapor barrier (aka moisture barrier). If you're doing a Pergo type floor and using it, cut a piece out of that. I used a heavy duty contractor garbage bag since it was thicker (6 ml's I think) as opposed to the floor barriers which were point something. I've heard of some people just draping it over their dishwasher, but I staple gunned it under my laminate counter (I only have butcher block on the island). Now if you're doing a cooktop in the butcher block, you need a heat barrier. Either pick up some aluminum tape they use for ductwork. Or do what I did and bum some off of the HVAC guy. Stick it around the edge of the counter where the cooktop is going (the back of it peels off, you don't need special adhesive). 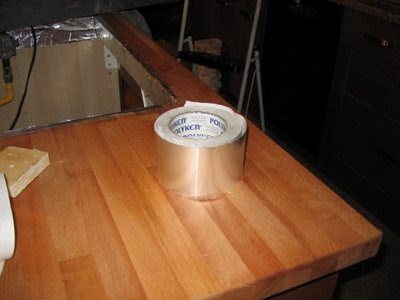 Use a block of wood, or something comprable, to rub along the tape to make sure it sticks well and is smoothish. Anyway, sink or cooktop or neither, it's been easy to maintain so far and I'm not a neat freak my any means. Just use common sense. Don't stick a hot pot on it. It's okay to cut a sandwich in half, but don't dice some beets on it. If you spill wine, wipe it up! And regardless, like a wood floor (real wood, not the crap they're calling real wood now-a-days) you can always sand and re-oil if there's a problem. I've never had a butcher block counter before, but I've had a butcher block cutting board forever. I scrub it down with soap and hot water after using it and re-oil every once in a blue moon. I can't fathom a counter is going to be much harder. On a final note, my two cents...during my Numerar vs. Pronomen debate in my head, the thickness of the Numerar makes such a difference. Obviously costwise, it's a bit pricier, but I think long term, it'll hold up better. Some people say they chose Pronomen because it's easier to cut, but cutting the Numerar was as easy as cutting the post-form laminate. UPDATE: While I loved this counter, it wasn't big enough. Click here to see how I ripped two IKEA Numerar Butcher Blocks lengthwise and joined them together to make one large counter. UPDATE #2: After I made it bigger, I added a dog feeding station via curb-side salvage material and crap from my basement. Click here to see how it came out. Thanks for the details. Do you have any more opinions now that you've had it for a few months? We've already purchased it, but haven't installed yet. Anything you would have done differently? Thanks. I would never pour bleach on it and let it sit b/c it had a wine stain and I was hungover and annoyed that I didn't even see it happen the night before. Yeah...bleach kinda eats through it, ugh. Who knew. But I sanded it and now perfectly fine. Perhaps a salad bowl finish would be a little less upkeep than the mineral oil. I did start keeping a little sanding block in the kitchen to use every now and again. But otherwise, no. It's not budging from where it is, those brackets are holding on just fine. No warping or anything. I'm happy very happy with it. Hope you are too! Any splits/cracks yet? Did you apply anything to the bottom of the numerar? The picture currently at the top of my blog is pretty recent...maybe from a few weeks ago. And as you can see, no problems. No cracks or warping of any kind. Do I absolutely need a heat barrier if my cooktop is sealed at the edges? I think the cooktop has its own heat barrier non? I understand what you're saying...I certainly didn't enclose my oven in anything before putting it in the cabinet. But, I'm no expert and everything I read online said a heat barrier was needed around the cooktop. 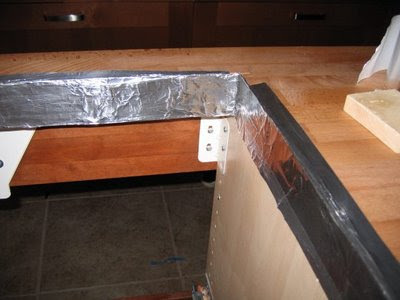 My guess is that since the butcher block involves strips of wood adhered together by glue, that a heat barrier is necessary to prevent the glue from being affect by the heat...again, I'm no expert and that's totally an uneducated guess. I tend to err on the side of caution when I'm not sure about something. Maybe a call to your cooktop manufacturer could clear things up? Okay I got paranoid and I managed to fit some in the gap between the cooktop and the countertop. Hopefully that does the trick. But having the gas cooktop run for a while, I noticed it doesn't generate much heat at all (bottom and sides are only slightly warm to the touch). Thanks for your response. What would you recommend for a backsplash? My feelings on backsplashes are the same as my feelings on countertops...as a Realtor I see people spending a lot of money to put in what's trendy. And that's a great idea...if you're selling your house while that trend is still in. Otherwise it'll just make your kitchen look dated. There are so many great options for backsplashes that aren't glass or subway tiles. IKEA had a beautiful pic in this years catalogue of a backsplash in a multitude of styles and shapes that was amazing. I also like the fabric backsplashes and the glass. The stainless steel is a great option a minimalist kitchen. Target has these beaded table runners I may use in my bathroom as a backsplash. As for my kitchen, I decided the integrated laminate backsplash was enough since I already have so many focal points going on, I didn't want to over do it. I think the key is to say to heck with the trends and simply do what you love. It's your kitchen, don't worry about what everyone else is doing. Thanks, the reason I asked is cause I'm having a real hard time find anything that looks good with the butcher block countertop (I see you don't have a backsplash for your numerar as yours serves for an island). I've never heard of fabric backsplashes, hmm... I dunno about that. But I guess I'll keep looking around. FWIW - a heat barrier around the edges next to your cooktop will prevent the ends of the wood from getting hairline cracks. These will take time to develop, nothing overnight. Maybe in a few years so it's probably too early for you to tell yet. As for putting a treatment on the underside... well, it should be done as it will greatly improve the look over it's lifetime. If you only treat the top side, you will have a much higher chance of the boards warping upwards at the ends. If you treat both top and bottom, you will have much less chance of warping. Also, I love the look of your kitchen! The most hits I get for this blog come from this post. Who knew? lol. I just wanted to say, it's been almost two years now and still no warping or cracking. It's a smidge stained in spots since I'm lousy at wiping it down and if I remember to oil that thing more than twice a year, it would be a miracle, but it's still looking good. I love baking and having all that room to knead the dough is great. If I find the time, I'll do an update post and show you guys what it looks like now. Hi! I came across your site when trying to figure out how to enlarge my kitchen peninsula on a budget. I have a cooktop in it, so I am interested in the butcher block with the cooktop. Is it still working out ok? Do you think it would work to connect a couple of pieces of the Ikea butcher block to make it wider? My peninsula is 3' wide, but I want to add a couple of feet to it. I thought about attaching two together...ripping them down and doing a whole glue clamp thing. I didn't do it but anything's possible with enough determination! I have no regrets with the butcher block. I barely oil it and it's still holding up really well. Good luck! Since you opted not to use the Ikea Behandla treatment what did you use instead? Well, like I said in the post, Ikeafans has a great post on various finish options for this counter, but I opted to use mineral oil. I think it looks and works great. Plus, super cost efficient! 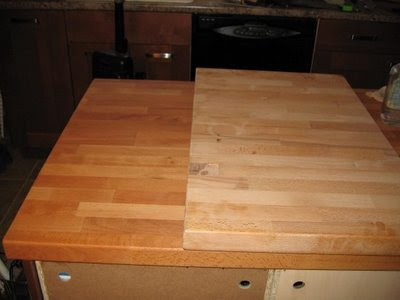 Would it be a crime to put a really tough finish over the butcher block, something like varathane? I love the wood look, but my husband would have a cow if it was wood, which he will say is too soft. We are looking at wood-look tile, but haven't found a good quality one yet. My understanding is that you can use a variety of finishes...but if you plan on cutting food on it, you want to make sure it's non-toxic. In term of durability, I guess that also depends on the type of wood you use...I've seen butcher block on very old vintage, as well as, antique pieces and they've held up better than most other options. Hope that helped! I would also check to see if food grade glue was used when the block was made. 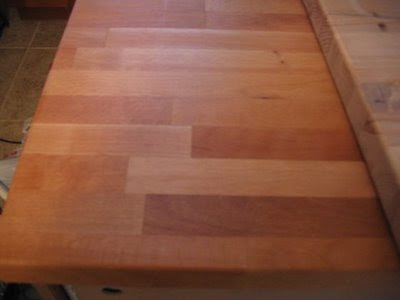 It's important to make sure that if you are seeking a true butcher block that it is an end grain or edge grain block. The ones I see here are all face grain and will deteriorate quickly and damage your knives. Edge grain and end grain will last much longer and will not damage your knives.